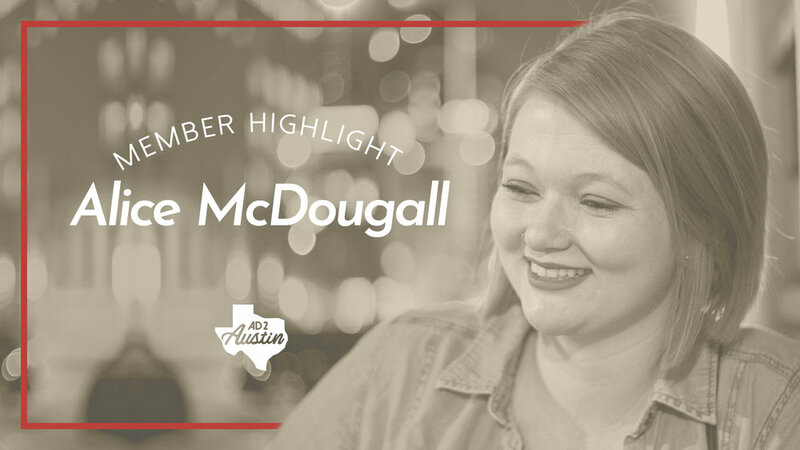 Alice McDougall is currently a Communication Design major at Texas State University, devotes 30-40 hours per week to her internship with UPS, serves on the Ad Club board at her school, and is currently the co-Education chair on our Ad 2 board. Is she tired, you might ask? Not at all. Alice graduates this May and she is ready to dive straight into her career! After attending a few Ad 2 happy hours and board meetings, Alice joined our team in January of 2018, and has been a wonderful asset to our board ever since- She has been helping an integral part of helping to develop our new Mentorship Program which was recently launched. Her favorite event that she has attended so far is the Mid-Year retreat. Getting to engage with other Ad 2 members from Hawaii to DC has been one of the biggest highlights of Alice’s Ad 2 experience, in addition to attending the conference and brainstorming how our Austin chapter can improve as a club. In addition to being on our board, Alice finds ideas through graphic design, art, photography, and her environment. She has always loved being creative and is thankful to have found a career in something she is extremely passionate about. Artists like Picasso and Banksy inspire her. “I like experimenting and using many different forms of art but the main ones that I like are drawing with charcoal and painting with either acrylic or watercolor. I just took a watercolor class so that was really cool to learn. I mainly do art just as a passion, but in the past I have participated in a few art markets selling art such as the Pecan Street Festival which was a great experience,” she says. Although she’s a creative at heart, Alice can also tackle the technical day-to-day tasks that might scare some artists away. She handles clients designs logos, t-shirts, websites, and has come up with branding for a cleaning service that was a client of UPS. She has even developed mobile app for my app her design class! Not only is she an expert multi-tasker, Alice is a Jill of all trades. This Newcastle native doesn’t let the uncertainty of post-grad life scare her, though. She knows how to embrace the unknown. “Try not to be afraid to take risks because that will allow you to learn more than you would if you were to play it safe,” she says. “Creatively I try to think outside of the box. That’s why I try to keep my eyes open to what’s going on in the world, and I listen to news. I like to know what’s happening, take a walk around the city, and see things from another person’s perspective,” she says.